This issue celebrated the start of the 21st Century with a collection of stamps depicting stamp delivery and processing technology over the previous 100 years starting with the 1901 Penny Universal stamp, which was issued on the first day of the 20th Century. 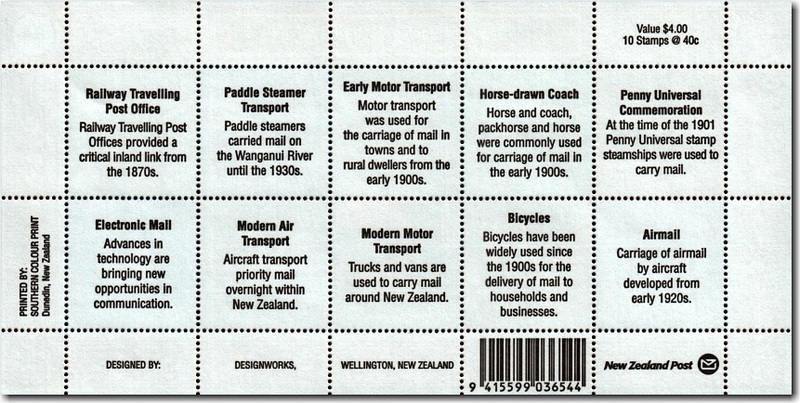 This was not the 100th anniversary of prepaid stamp delivery within New Zealand - the 1955 Stamp Centenary issue commemorated that. 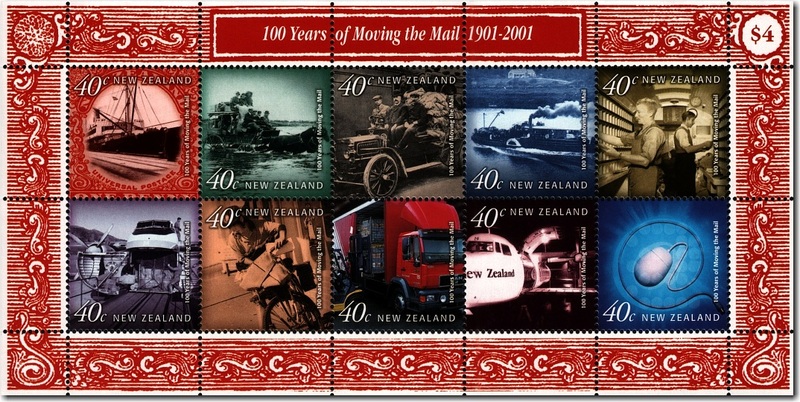 Indeed, the 150th anniversary was celebrated four years later with no less than three separate issues: 2005 150 Years of Stamps 1855 - 1905, 2005 150 Years of Stamps 1905 - 1955 and 2005 150 Years of New Zealand Stamps 1955 - 2005. This issue marks the 100th anniversary of Universal Penny Postage - one penny postal charges within New Zealand and to overseas addresses (to countries that would accept the mail). Penny postage was a very bold and far-sighted move at that time - effectively halving the cost of postage within New Zealand and reducing the cost of posting a letter to the United Kingdom from 6d to 1d. The move and the surrounding publicity quickly paid off and the increased volumes of mail offset the reduced revenue per letter within a year or two. Universal penny postage turned New Zealanders into a nation of letter writers. Printed on the reverse side of each stamp over the gum is a title and brief description. 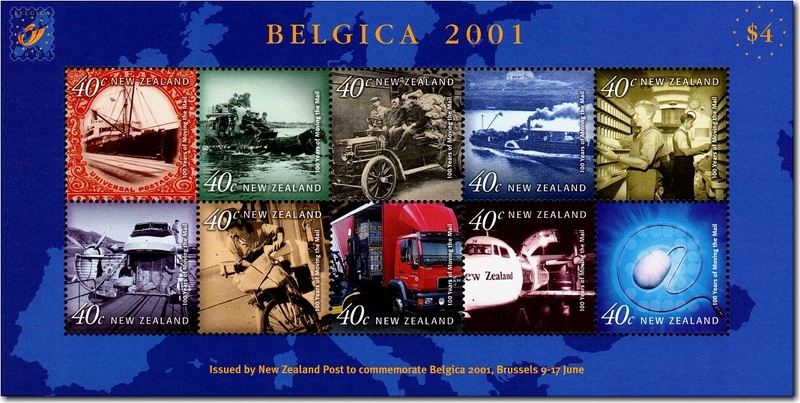 This sheetlet which sports a blue border and does not have the explanatory text printed on the gum-side was issued to commemorate the 'Belgica 2001' stamp exhibition which was held between the 9th of 17th of June, 2001. This sheetlet is catalogued separately under 2001 Belgica Exhibition.